As much as I know about computers I've been kind of out of the loop and just looking for second opinions. Upgrading from a 9800 GT I'm looking at this one here: http://www.newegg.com/Product/Product.aspx?Item=N82E16814130652 - GTX 550 Ti 2GB 192-bit GDDR5. So from the stats it should be a huge increase and from the reviews people are playing WoW, SWToR, BF3, etc. on maxed out settings at 90+ FPS. Seems like a great deal. Thoughts? you might want to check out..
also as far as video card for nvidia i would stick with evga (at this point and time) they still seem to be the best. make sure you compare specs.. cheaper sometimes means less performance.. So the rest of the stats of that 560 would beat having double the ram in the 550? These fine specifics are what I don't know, lol. dbl the ram can be a good thing.. but the 550ti if i recall correctly(could be thinking of a different model) wasnt really tuned for gaming thats why the 460 beats in performance.. I'd always look at the GTX version of any Nvidia card. They have a longer shelf life in performace then spending down for the same GPU. 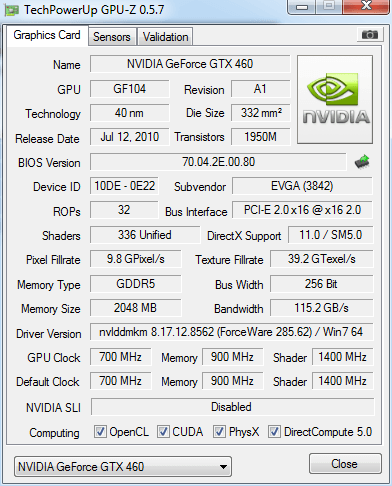 The 470GTX I have does plenty good in anything I play including BF3 and running muntiple instances of EQ2. If your looking for a rock solid brand? go with EVGA. I have only had 1 card of theirs fail on me after 4 years of use and they replaced it within 5 days with a 2 generation higher card due the lifetime war. Yeah that's basically exactly what I'm looking at Pasa, the EVGA GTX 550 Ti. I'm considering the one Gkar linked too. I'm just surprised that if the 550 Ti isn't configured for gaming, that all these people reviewing saying they're playing wow/swtor/bf3 on max settings at 90+ fps. 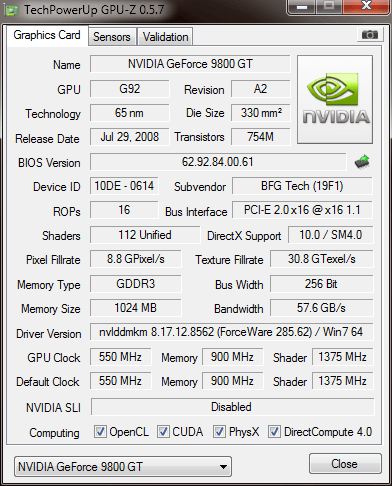 The next evga one is a gtx 560 with 2gb of ram. I'm kind of torn but I'm pretty much in the realm of "anything is better than a 9800 GT"
I'll need a better power supply no matter the choice so that's something that's kind of adding to it as well. Aily - the 550 ti is a bad choice. Either get a 6850 or a 6870 if you're looking to spend 120-150ish (6870 would be better if you can swing it). If you're looking to spend a bit more, a 560Ti or a 6950 are good bets. I snagged a 6950 last week for $219 and was able to unlock the disabled shaders so I essentially have a 6970 for $100 less. Now it says in feedback it takes 2 pci express power cords so looking at power supplies I see them saying 2x6pin or 2x6+2 pin, or 1x6pin + 1x6+2pin. It's been too long since I looked into this stuff, will any of the above work? power supplys.. always tricky.. i hate recomending..
i have a thermaltake 750 i paid 180$ at best buy, its 1 year old now and so far no problem. Yeah the start of this computer is a generic wal-mart HP i threw a 9800 GT into.. so.. yeah. I do have my altec super lanboy case sitting just on the table yonder I could get it into but i think it opens the opposite way this one does. I would google around a bit to see what power is needed per different power estimater gadgets. Right now running my 470 and i7 970 im using 180 watts / 9.5A idle. Well either way I need to upgrade the P/S solely for the pci-express power plugs as I'm pretty sure this one does not have it, but I could always double check. Ty on the suggestions.